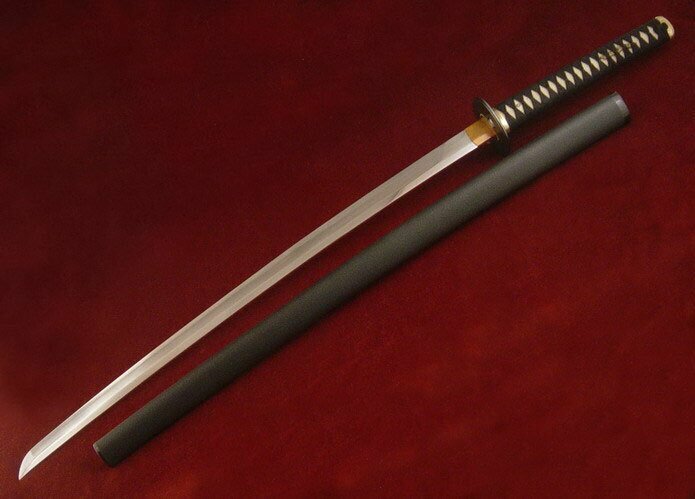 Citadel Katana Battodo(CDK9) Katanas for tameshigiri, forged, sharpened and polished in traditional way. Differentially hardened with authentic hamon. Habaki : tempered copper forged on the blade. Tsuba : n° 1, aged iron. Tsuka : 11.14", Jackwood entirely wrapped in top grain Same. Tsukaito is Ineri Maki with first choice Japanese black silk. Menukis are bronze dragon n°2. Bamboo Mekugi. Fushi-Kashira are polished solid bronze. Ito Domes are made of two brass, filed foils.